A sequel to the 2014 hit, Ride Along 2 arrives at a time when Oscar nominated movies are still clogging theaters, and Star Wars: The Force Awakens continues to keep the turnstiles spinning. It’s as if the movies haven’t yet recovered from last year’s hangover. So it’s hardly surprising that Ride Along 2 reflects Hollywood’s unstoppable tendency to re-wrap ingredients that led to previous success. This second helping does little more than add a bit of Miami glitz to a formula that wasn’t especially inspired to begin with. As fans of the series already know, Kevin Hart’s Ben Barber is a bumbling dope. Ben, a wannabe cop in the first movie, now has a job as a uniformed police officer in Atlanta. He’s also poised to marry Angela (Tika Sumpter), a woman whose brother James (Ice Cube) is a hard-boiled Atlanta detective. You know the drill. Ben does dumb things; Ice Cube’s James tells Ben that he has done dumb things. Hart revs his comic engine; Ice Cube scowls. An especially lame story finds James traveling to Miami to help find a hacker (Ken Jeong). Eager to prove his worth, Ben wants to tag along. A reluctant James agrees, hoping once and for all to prove that Ben hasn’t got the right stuff to be a detective. Showing about as many facial expressions as the frozen-faced Ice Cube, a stiff Olivia Munn portrays a Miami detective who rounds out the law enforcement side of the equation. Benjamin Bratt plays a less-than-frightening drug lord who corrupts public officials. He, too, is after Jeong’s character. 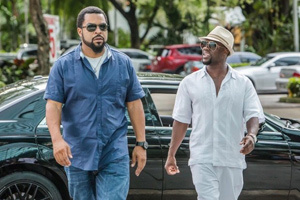 Whether you find Ride Along 2 to be laugh-packed depends on how funny you find Hart. He’s energetic, and likable enough, but there’s not enough fresh humor in Ride Along 2 to compensate for the numbing amount of gunplay or a particularly gross scene in which Ben is forced to pick hair-covered nachos out of a trashcan and eat them. Director Tim Story, who made the first movie, as well as the much better Ice Cube comedy, Barbershop, makes Ride Along 2 seem less ragged than it actually is by sprinkling it with female bodies and high-gloss shots of Miami. Look, I’ve got nothing against dumb comedies and obviously, Hollywood doesn’t either, but even dumb comedies need more by way of novelty than Ride Along 2 manages to muster.